Hotel Norte y Londres , , Spain. 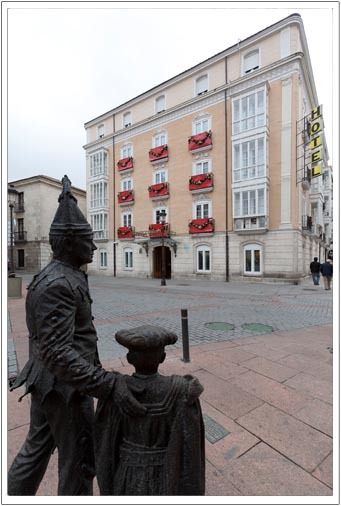 The Hotel Norte y Londres ** is in the heart of Burgos, in the pedestrian plaza de Alonso Martínez, just 150 meters from the Cathedral, the statue of El Cid and the shopping and tapas area. Founded in 1904, the hotel is dean of the city and the oldest of all the Posadas del Camino de Santiago, being fully renovated and equipped. Receive a friendly, polite and cozy welcome, without sacrificing the demands of today, in a hotel ideally located to enjoy all the sights, shops, rides and food from Burgos without having to take the car. Even when located in a pedestrian area, all of our customers can access the public parking in the Plaza of Spain by pressing the button marked in the pedestrian entrance and stating that you are a client, so you can receive a 10% discount. Phone: (+34) 947264125 - Fax: (+34) 947277375. info@hotelnorteylondres.com.